At Safe Ride 4 Kids, we consider the Tummy Shield™ to be Baby’s First Car Seat™. We feel it is important to fill out this Tummy Shield registration so that we can contact you with any important safety information from the manufacturer—ie. 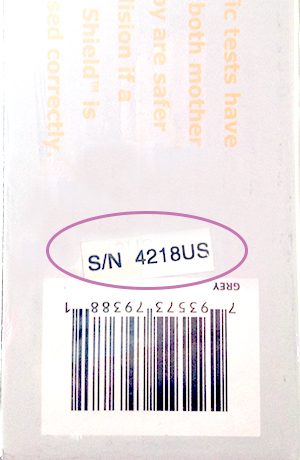 product recalls—much like car seat manufacturers ask that parents register their new car seat. 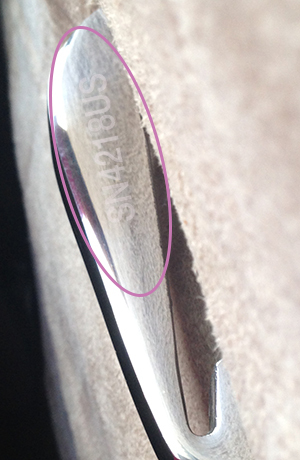 You can find the serial number either on the box or on the anchor of the Tummy Shield (you may have to maneuver the Tummy Shield around in the light to be able to see it on the anchor) as shown. This database will fall under our Privacy and Anti-Spam Policy. In order to protect your privacy, Safe Ride 4 Kids does not sell, share or trade our subscriber list with anyone for any reason and you may unsubscribe at any time.